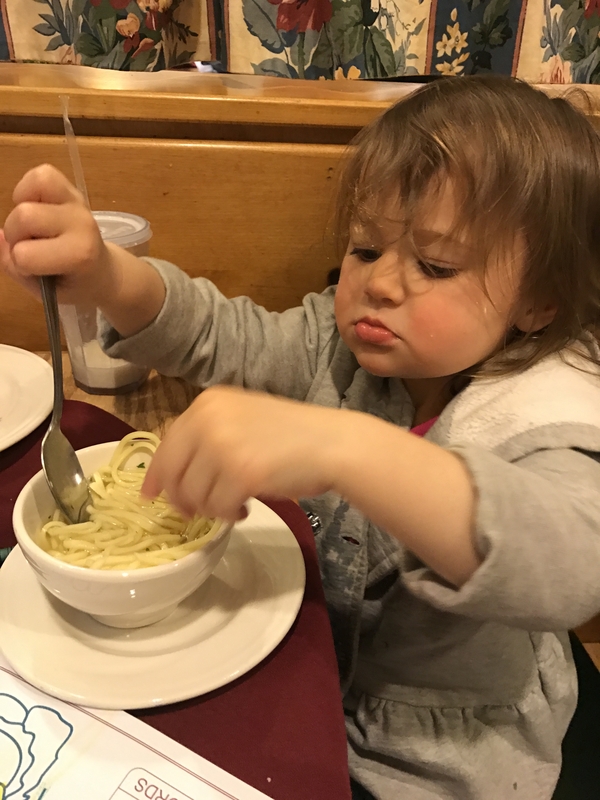 Disclosure: My family received a complimentary stay at the Bavarian Inn and dinner at Bavarian Restaurant in exchange for this review. All thoughts and opinions are my own. 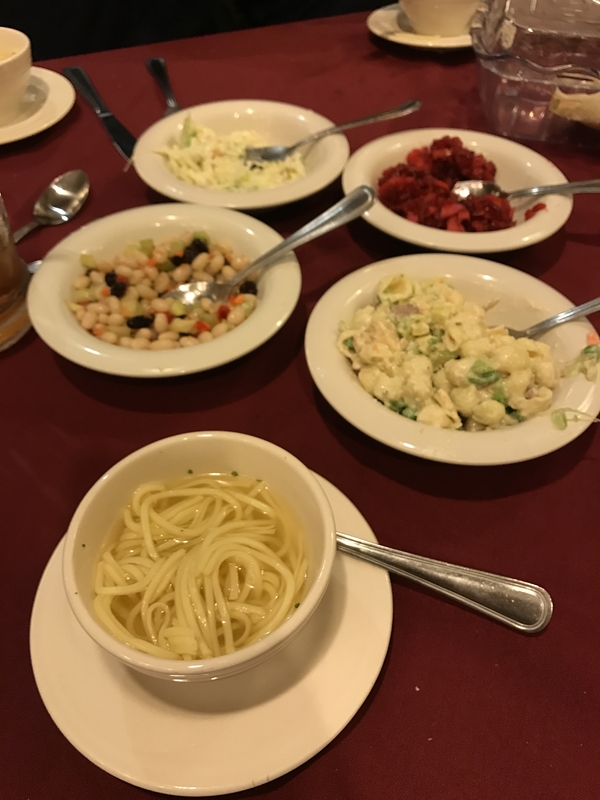 A few weeks ago, my family and I had the opportunity to check out Bavarian Inn and Bavarian Restaurant for a quick little getaway. 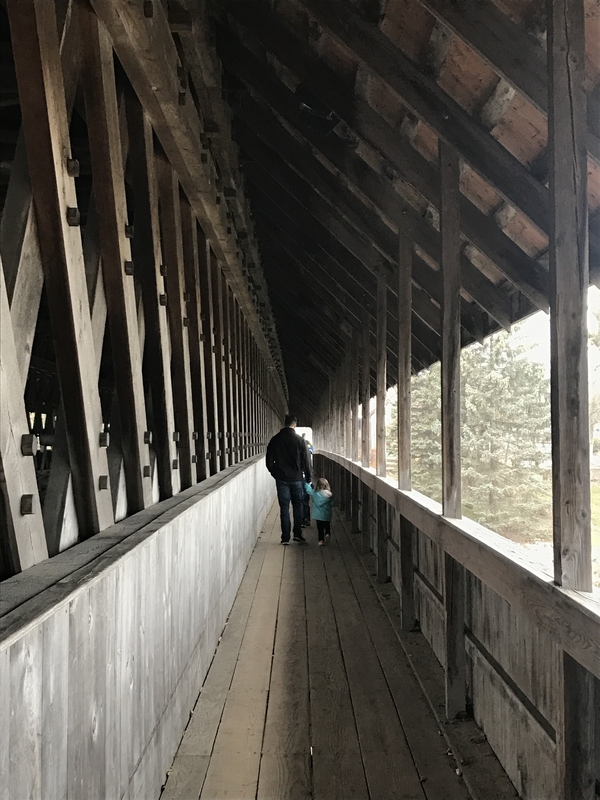 It was perfect timing as the weather has still been so frigid here and cabin fever was reaching an all time high. 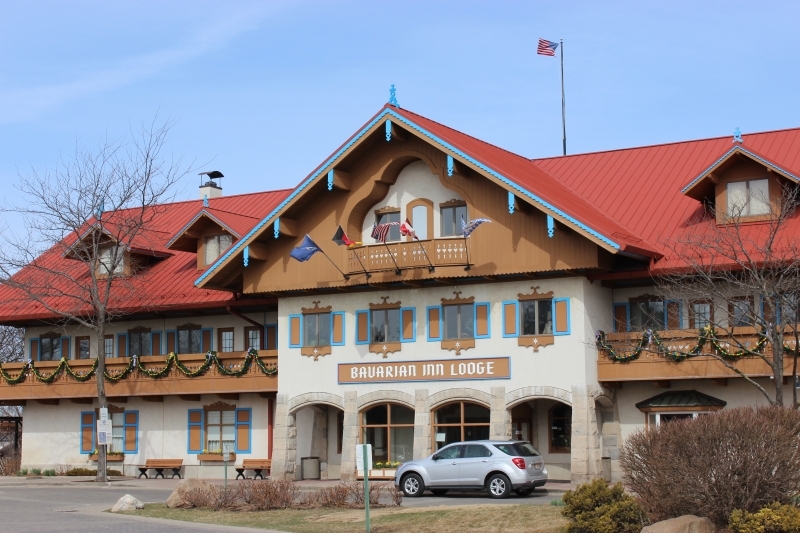 Located in Frankenmuth, the Bavarian Inn Lodge, is one of Michigan's top tourist destinations. 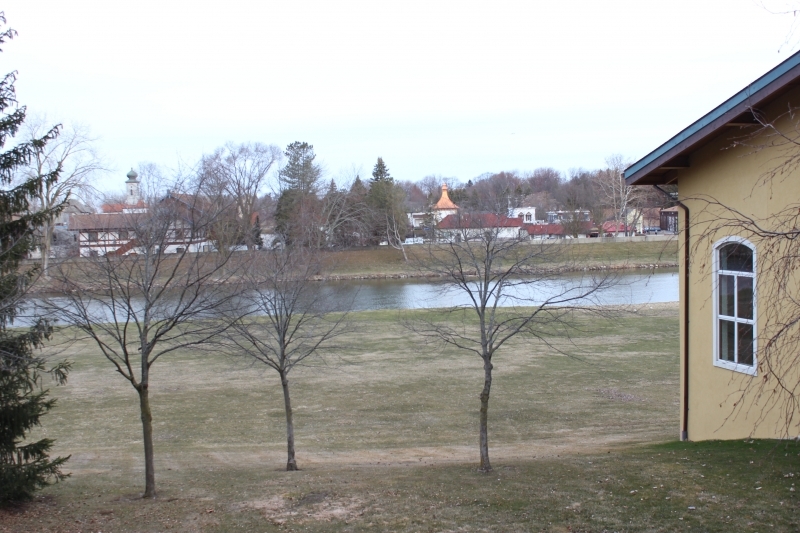 The Inn is nestled along the Cass River and has a fun European theme throughout the hotel. 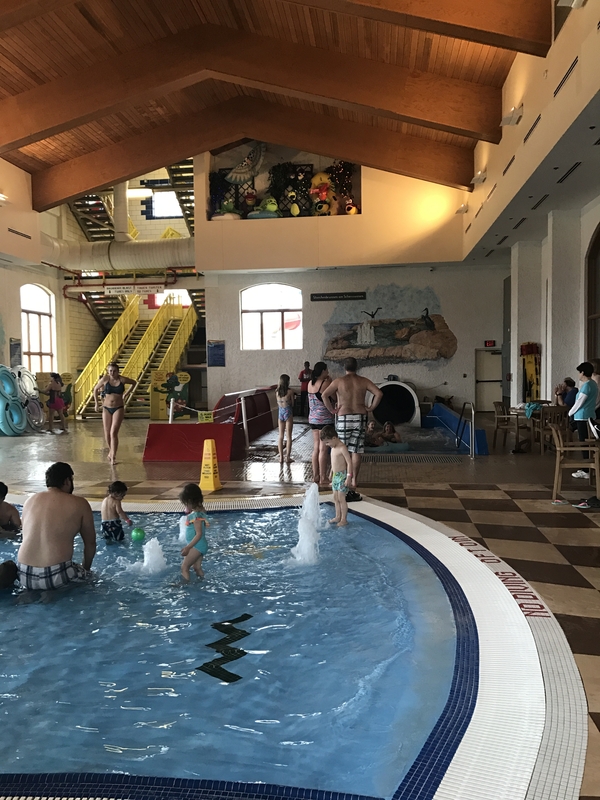 It's a great option for family as it has a large indoor water park with two large water slides, three pools and two whirlpools. 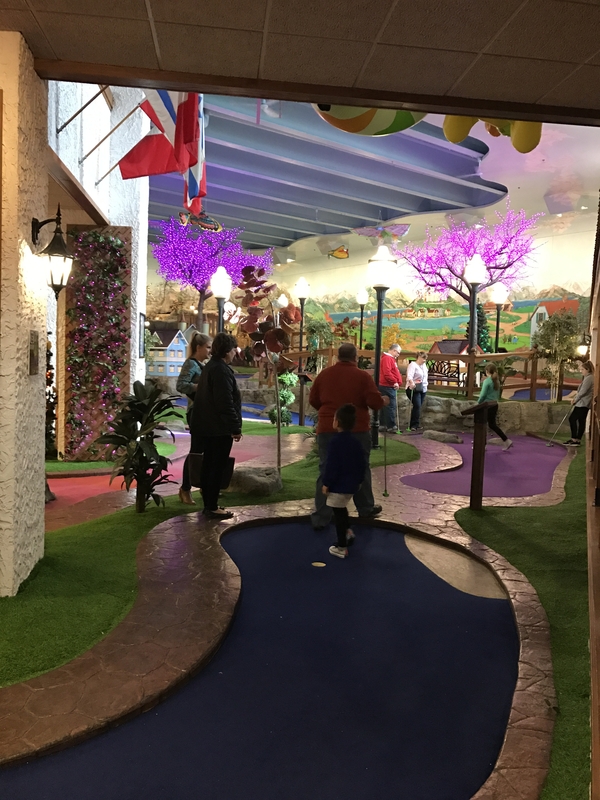 The 35,000 square foot Family Fun Center is loaded with a ton of fun video and carnival style games, a children's play village and indoor mini-golf course. We spent most of our first day hanging out in the pool area! 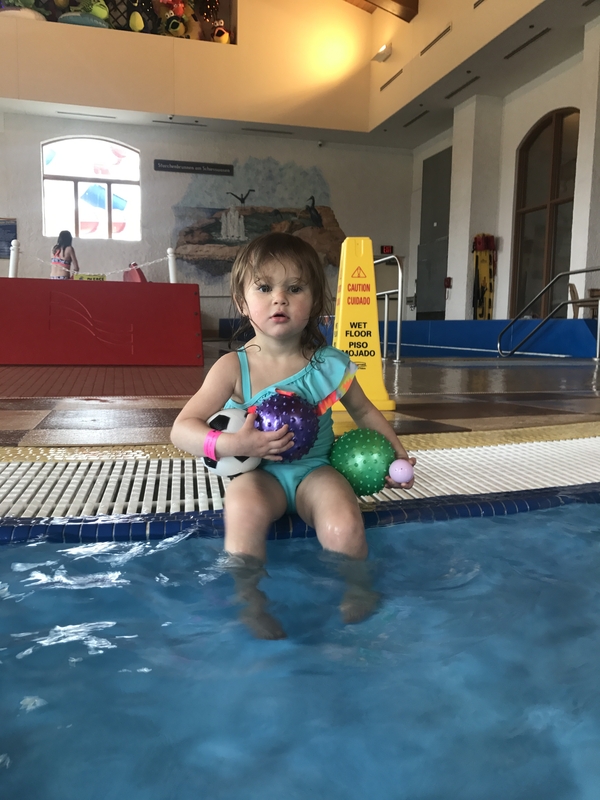 Since both of our kiddos are pretty young (2 and 4 years of age), the toddler pool was perfect for us. 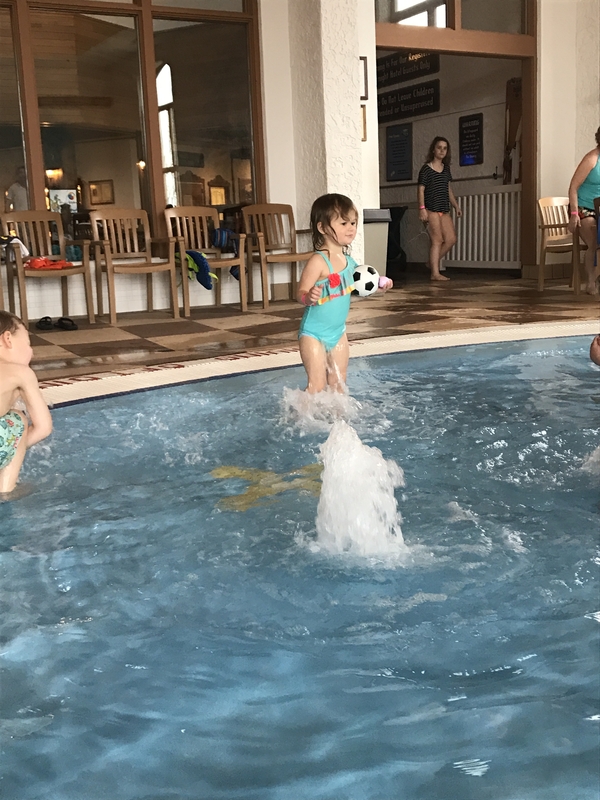 The kids absolutely loved the geysers and splash fountains, meanwhile my husband and I waded in the water with them without having to be overly worried since it's a toddler friendly depth. After swimming, we had a huge dinner at Bavarian Inn Restaurant. When I say huge, I mean HUGE! So much food! 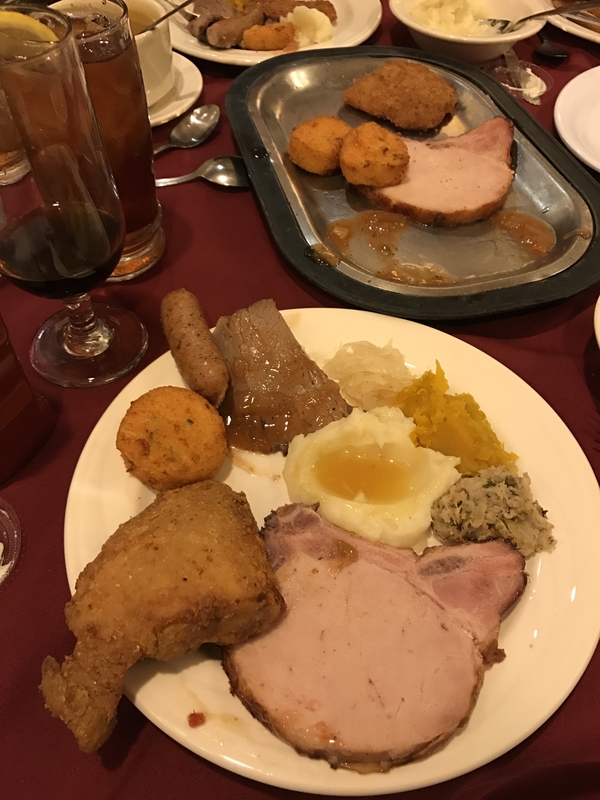 The Bavarian Inn is well known for it's chicken dinners, baked goods and great selection of German beers. 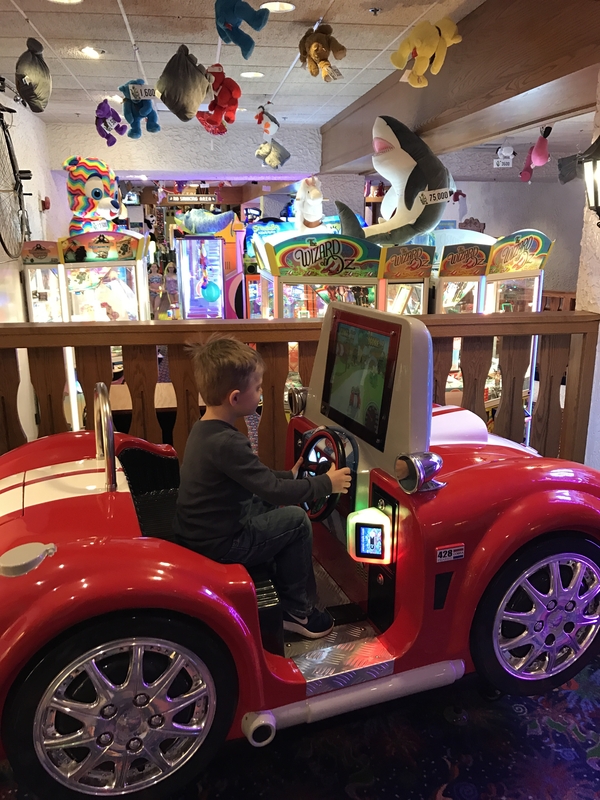 The European themes restaurant is perfect for families and seeing the servers in traditional German clothing is such a fun twist. 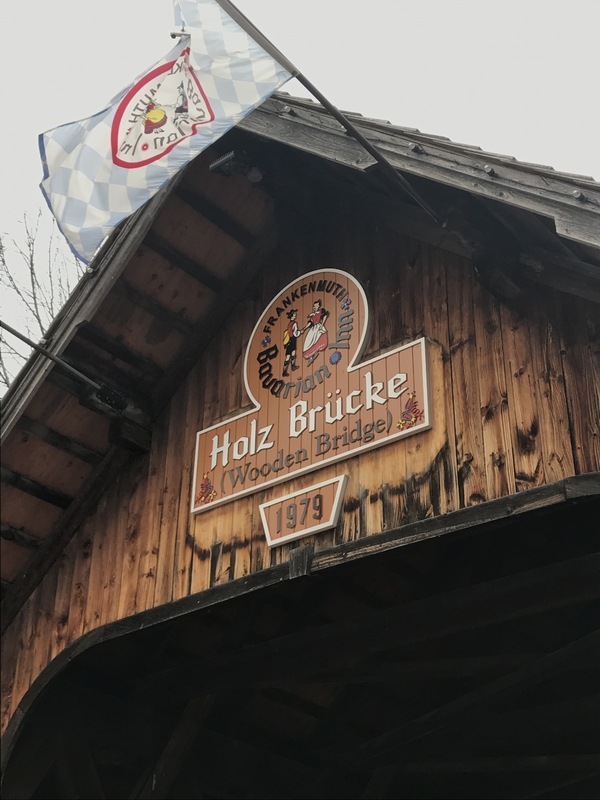 We ordered the Ultimate Family Style Bavarian Dinner to get a taste of everything and we mean everything (plus a pitcher of German Dunkel beer)! Our breads are made fresh in our bakery! Stollen (fruit & nut bread), backofenbrot (housemade white bread), noodle soup, cole slaw, pasta salad, cranberry relish, a Michigan seasonal salad, baked dressing, vegetable du jour, 100% real mashed potatoes and gravy, buttered noodles and housemade ice cream. After dinner we took a quick walk back to our hotel room (they have a shuttle too, but it was a nice day and we wanted to run some more energy out of the kids). 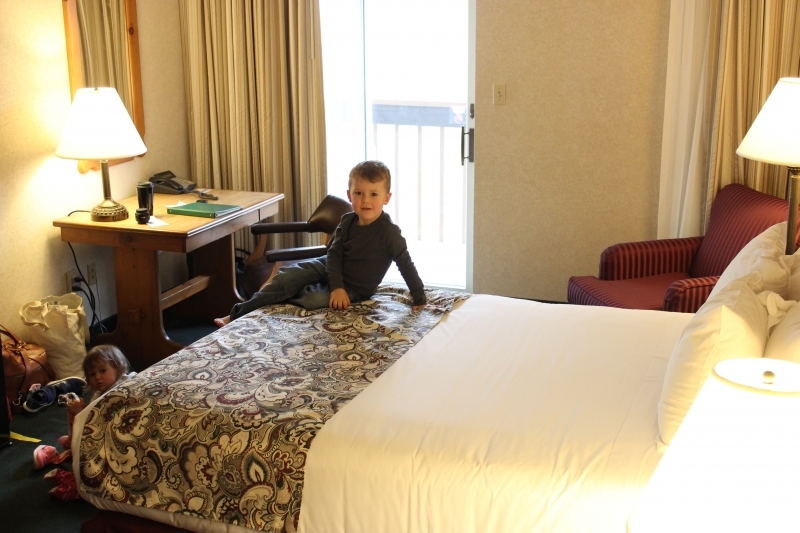 The rooms are nice and spacious and Aiden was so excited to sprawl out in queen bed to himself. LOL. 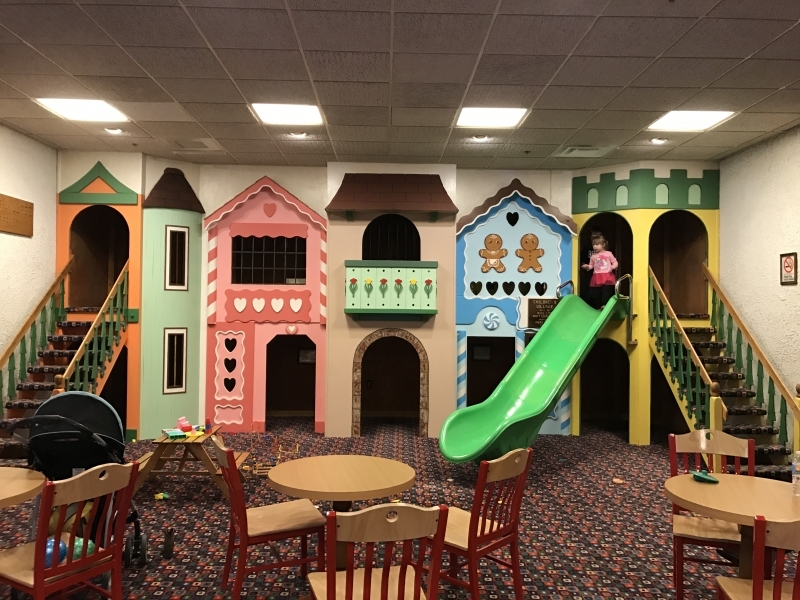 The next morning we grabbed a late breakfast buffet at Oma's Restaurant (located right in the hotel) and then headed to the arcade and Family Fun Center (mini golf!). There are SO many arcade games and I was shocked at how cheap it was to play. Aiden loved every second of it! 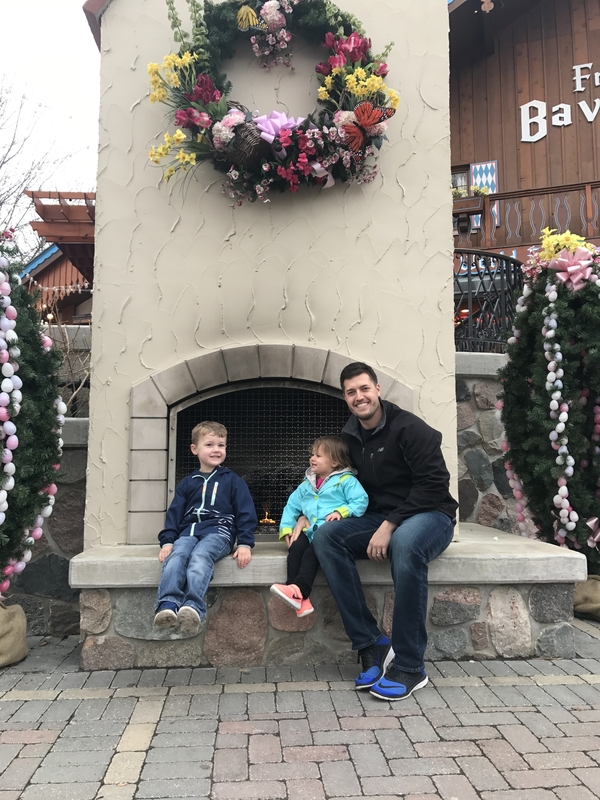 Bavarian Inn and Restaurant was a perfect little getaway close to home! 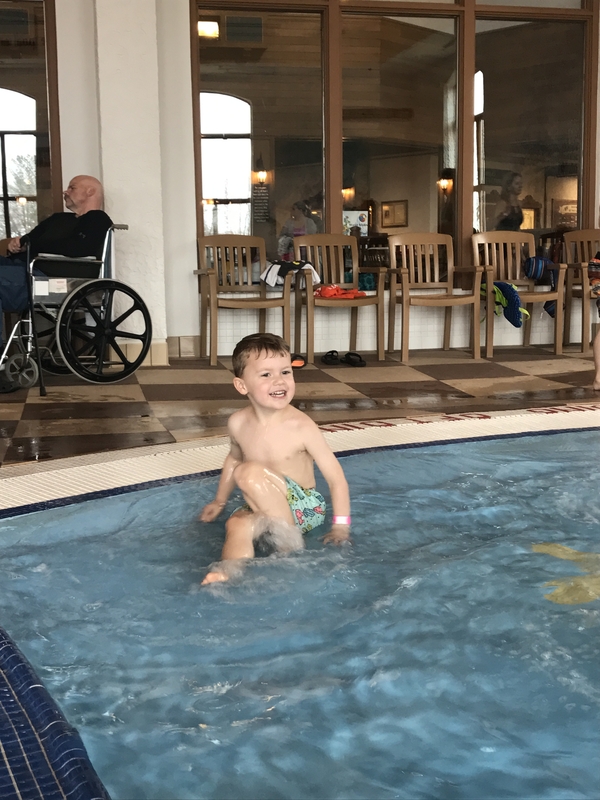 Aiden's already been asking to go back so he can play in the pools! 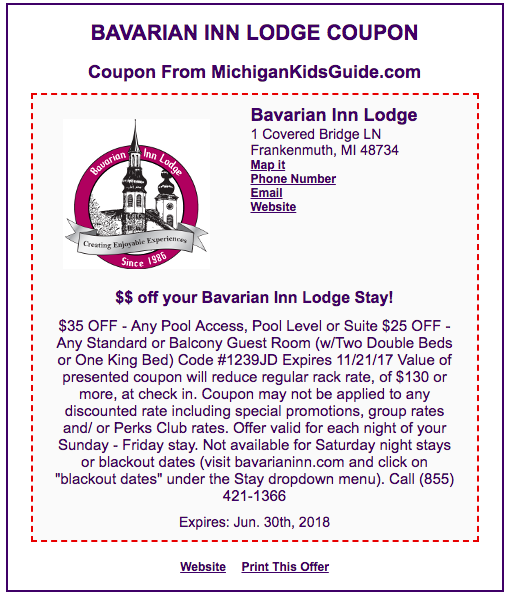 I have two great specials to share for The Bavarian Inn Lodge and The Bavarian Inn Restaurant. 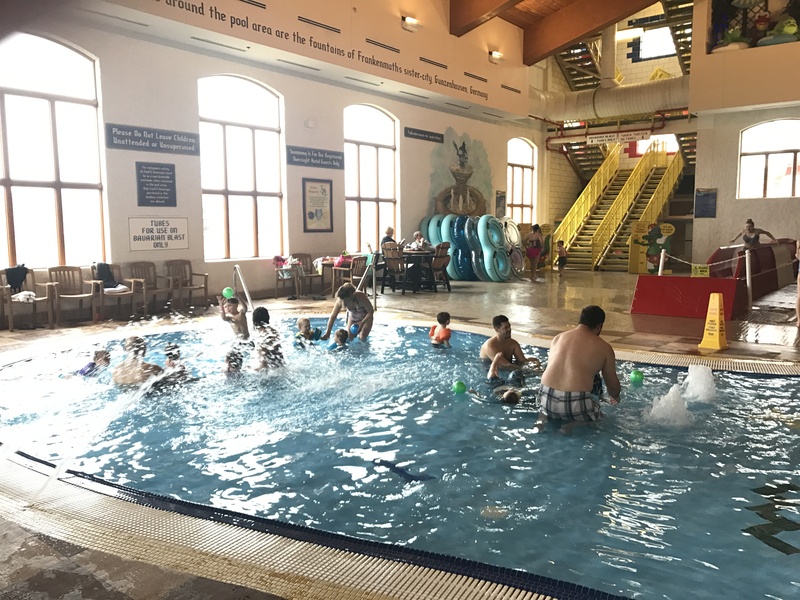 The Bavarian Inn Lodge is one of the state's largest Indoor Water Park Hotels. 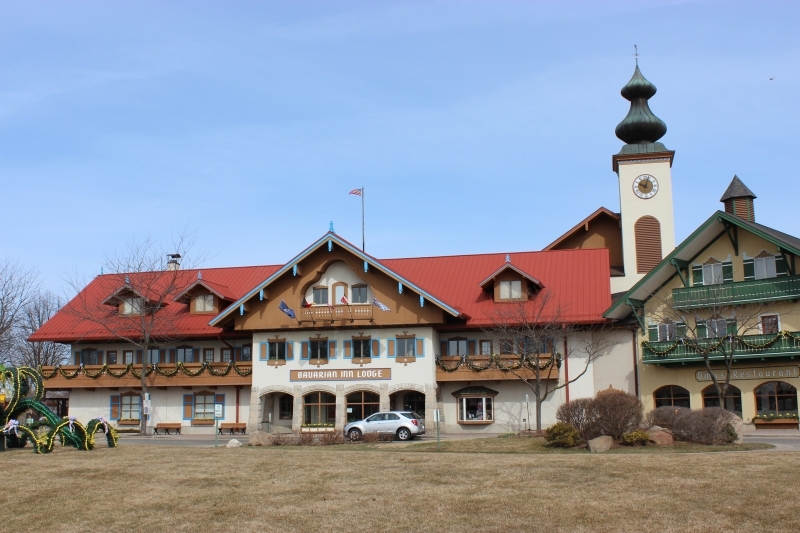 Celebrating 125 years of service in 2013, the Bavarian Inn Restaurant has become a Michigan landmark. Call (855) 421-1366 for more information or click the coupon below. 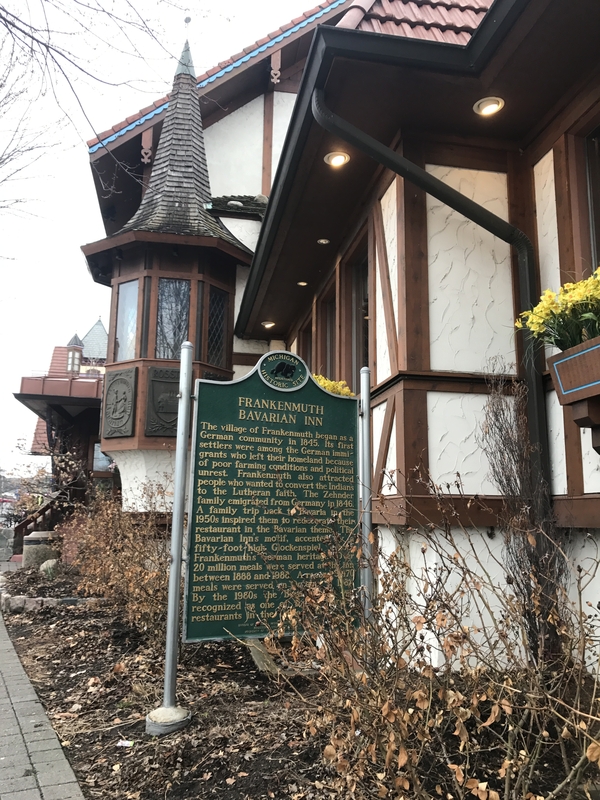 Grab an exclusive coupon for Bavarian Inn Restaurant Half Off at the Bavarian Inn Restaurant HERE! 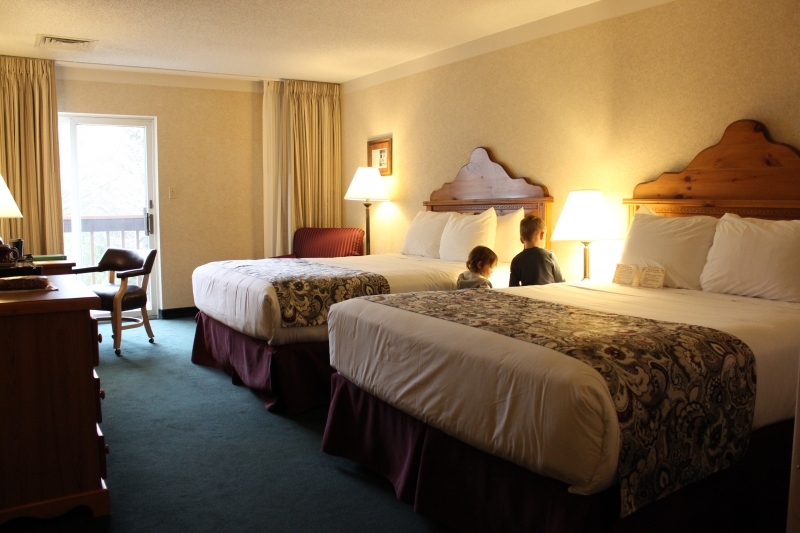 Have you been to a theme hotel or inn before?